With a well deserved name, the Common Earthball (Scleroderma citrinum) is very numerous during the summer and autumn months, in and around damp woodland in rich peaty soil or moss. It is often in small scattered groups of 2 to 4 or so together, sitting there like discarded old potatoes! It is a mycorrhizal species and shares this special relationship with deciduous trees, especially oak, beech and birch. ‘Potato like’ is a good analogy I think. They can grow up to 10cm in diametre and have an irregular ovoid like shape. The colour can be dirty yellow to ochre brown with rough scales all over the surface. The difference ends once you cut the fungus in half. In an immature specimen you will find a solid blackish spore mass (the gleba) with a subtle marbled effect. The smell is quite a strong metallic odour which I find very unpleasant. At maturity this spore mass will turn into fine power and the outer surface will rot and split wide open in a random spot, unlike the puffball trait of opening at the apex, to release it’s spores. 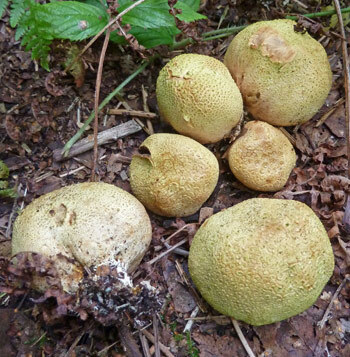 There are several lookalike Earthballs out there, such as the Scaly Earthball and Leopard Earthball. These have some key differences, such as the surface texture or pattern. But there is quicker way to identify between these similar fungi. 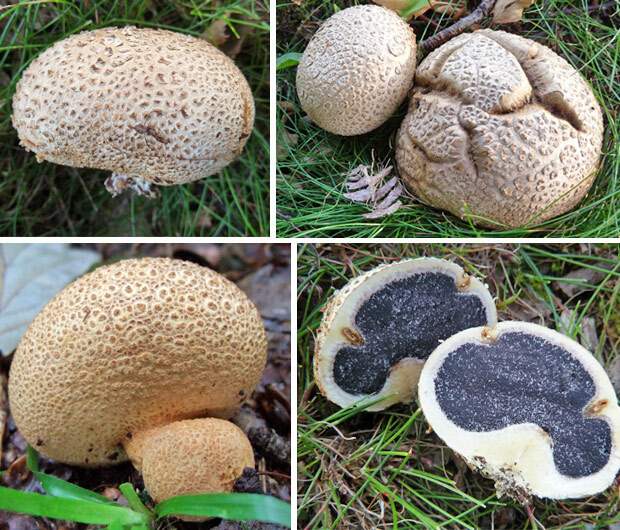 Unlike these examples, the Common Earthball has no stem at all, merely mycelial white cottony cords attached to the soil and it’s outer skin is very thick in comparison (from 2 – 5mm). Simply squeeze a Scaly Earthball and you’ll easily misshape the whole thing, the Common Earthball on the other hand won’t budge. Nice and sturdy. Anyway, it goes without saying that this Earthball along with the rest are quite inedible, and the Common Earthball has been classed as poisonous in the past (which I agree with), but one comment from Jo (below) mentioned they are eaten regularly in the Philippines where she is from. However Gareth and Deborah from UK (another comment below) had a bad experience with sickness. I don’t like the smell (or the looks of them) at all, so I’ll just be avoiding it in future – like a bad potato. 2-10cm in diametre. Almost Spherical / Irregular potato shape. Dirty yellow to ochre brown with coarse scales. Outer wall thick. No stem. Attached to soil by fine mycelial threads. Purple/Black with white veins / markings. Turns to powder when mature. Rich soil in and around deciduous woodland. Summer & autumn. Widespread & very common. • Interior of fruiting body full of gleba (spores); solid when young, as a powder at maturity. • Often small or no visible stem. Update: 3rd October 2012. Two Fungi as One! If you’re lucky, you may get see the Parasitic Bolete (Pseudoboletus parasiticus) that exclusively grows on older bodies of Common Earthballs and therefore easy to identify. The matt textured, olive/brown/yellow cap grows up to 4cm across. Sometimes there are several feeding off the one earthball. They’re pretty widespread and occasional, and in-fact edible (some say not) but definitely not poisonous. The picture below was kindly sent to me from blog follower Chris Thornley. It was found in woodland near Sandringham. After rain, the cap seems to have a tacky texture. Thanks for the pic Chris. The Common Earthball is not harmful to trees or life around it, in fact it’s ecology is mycorrhizal, meaning it lives in symbiosis with the trees (roots) around it. They both swap nutrients to benefit each others well being. My horse came in from the field with a 2 to 3 inch diameter area on his thigh with the hair and skin off. Couldn’t find how he had done it but my question is? There are Puffballs or Earthballs in the field, some of these are open and wet like a paste in them. Is there anyway if my horse had rolled in one of these that they would burn his skin? The Earthballs spore mass is mildly toxic but only when consumed. I have handled the inner gleba, and as far as I know it doesn’t cause irritation of the skin. Likewise, I’m unsure if it would affect open wounds or damaged skin. Would your local vet know? Glad you’re enjoying the blog. The Earthballs have a beneficial mycorrhizal association (symbiotic relationship) with hardwoods and conifers, exchanging sugars and nutrients. So they won’t be responsible with harming the neighbouring trees. I hope you do find out what is though. It’s quite rainy here in the Philippines so mushroom similar with the COMMON EARTHBALL (Scleroderma citrinum) grow in the forest. My father usually get this kind of mushroom during rainy season and we actually eat it — kinds with white and dark purple color inside. This was food since the old days with the old people and there was no report of discomfort and food poisoning. We call it here as “buo” which means whole. I eat it ever since I was young and nothing happened to me. So, I think it’s edible. We live near the forest and the season here are rainy and summer. It’s usually 15-23 degrees Celcius. It may well be a different species that looks similar. We may not have it here in the UK. I was trying to find the English name for this mushroom, found it, and was quite surprised to learn that it’s inedible in some countries. I’m also from the Philippines, particularly Baguio City, and yes we do eat this kind of mushroom. But then again it might be a different kind of species as you suggest. Hi Luis, yes – it may be a different species. Or if it isn’t then I’d be interested to hear what it tastes like and how you cook it. I was born in countryside in Thailand. I think I knew the similar one you have mentioned to COMMON EARTHBALL. There are different species, as the one in Asian is buried under the ground. This is grown above ground and has different texture. I’ve picked some today and look them up and come across your comment. I think this is what people in other comments here are thinking of. What you have described may possibly be Thai truffles (Astraeus hygrometricus), although I’m not sure, but that’s my best guess. Thanks for the extra details. Well, we have them in our veg patch and, before seeing this wonderful site, thought they were puffballs. I picked one the size of a golf ball, sliced and fried it, so that we had half each. With a full meal, it was okay but not exceptionally tasty. About two hours later, with a blocked nose and a bloated stomach, we were both getting out of bed. Being upright, we were dizzy and sweaty, so made it to the toilet, soon to be sick and to bring it all up. We feel fine now but are staying up for an hour to check on each other. We have spoken to the NHS, on phone number 111, to a nurse and are now waiting for a doctor to give us the all clear. We’ll be fine now. Thanks to this site we were easily able to identify these as earthballs and to make a decision on what to do next. Oh, and don’t eat Common Earthball mushrooms in the UK!! Sorry to hear you had this bad experience, but fortunately you’re OK now and have confirmed that it is a bad idea to eat the Common Earthball. I have amended the last paragraph on this article again – generally to warn people to avoid these little guys. Found your blog and it’s really useful, thanks. We live next to a woodland and our disused chicken run is full of these. How do I get rid of them so that I can reintroduce chickens? Unfortunately, you’ll just have to remove them when they pop up. The mycelium (the vegetative part of a fungus which is a large mass of white thread called hyphae) will grow wide and quite deep, forming a beneficial relationship with the surrounding plants or vegetation, so total removal or stopping them completely is extremely difficult – sorry! There in my tarmac drive way , pushing the tarmac up like little mountains. Can’t believe how powerful they are. tried to kill with bleach and petrol, still survived. Respect. I know what you mean. I saw several the other day pushing up someones drive, although they were at the edge. But I guess they weren’t too welcome still.